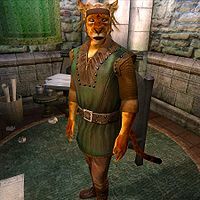 Ra'jiradh is a Khajiit scout living in the Talos Plaza District of the Imperial City. Along with his two brothers, Urjabhi and Hassiri, Ra'jiradh runs the officially sanctioned publication, The Black Horse Courier, which is distributed throughout Cyrodiil. The three brothers take turns maintaining the office of the Black Horse Courier in the Market District and on Loredas, Sundas, Morndas and Tirdas, Ra’jiradh will, after waking up at 6am, wander around the main reception room until he calls it a day at 8pm. He then heads back to the house for a four-hour dinner before going to bed at midnight. On all other days he starts the day with a two-hour breakfast in the messy second floor office until 8am, when his daily routine will change for each new day. On Middas, he goes back home and wanders around the ground floor until dinner at 8pm. On Turdas he heads to the Arboretum and strolls around, enjoying the sight of the many statues and chatting with the other citizens until his dinnertime at 8pm. On Fredas he heads back home to the mansion and spends a couple of hours there before leaving for the Green Emperor Way where he stays until he returns home at 2pm. During his time near the tombstones, he will occasionally run all the way back to the office in the Market District, and then return to the Emperor Way. After heading home at 2pm he stays there until dinner. Due to the unfinished Imperial Express quest, in which the Black Horse Courier was supposed to play a big part, there are three crucial exceptions to his daily routine: At 4pm on the 4th, 13th and 23rd of each month, he will break off his routine, equip his cuirass, and run all the way to Leyawiin where he meets up briefly with Five Claws Lodge innkeeper Witseidutsei and then runs all the way back to the Imperial City. If Witseidutsei is not alive, he will simply stick to his everyday life in the big city. His clothing is middle-class in style and consists of the zero weight forester's shirt with tan linens and a pair of quilted shoes. Additionally, Ra'jiradh carries a chainmail cuirass, a set of greaves and a fine steel longsword. Most of the time, his armor and sword are not equipped, and can be picked from his pockets. He also carries a few gold coins and his house key. He will introduce himself as follows: "Ra'Jiradh greets you. His brothers are Hassiri and Urjabhi. The Black Horse Courier is our Imperial news service, chartered by the Elder Council" and tells you more when you ask him about the Imperial City: "You see Khajiit always running through the City? You see Ra'Jiradh and his brothers! We bring the Black Horse Courier to the good citizens, yes?" Ra'jiradh was supposed to visit the Arboretum on both Tirdas and Turdas, but his wander package inside the Black Horse Courier takes precedence on Tirdas. Ra'jiradh's name is often spelled with a capital 'J' in dialogue. Esta página foi modificada pela última vez à(s) 23h12min de 25 de abril de 2013.